Could Soylent really replace all of the food in your diet? 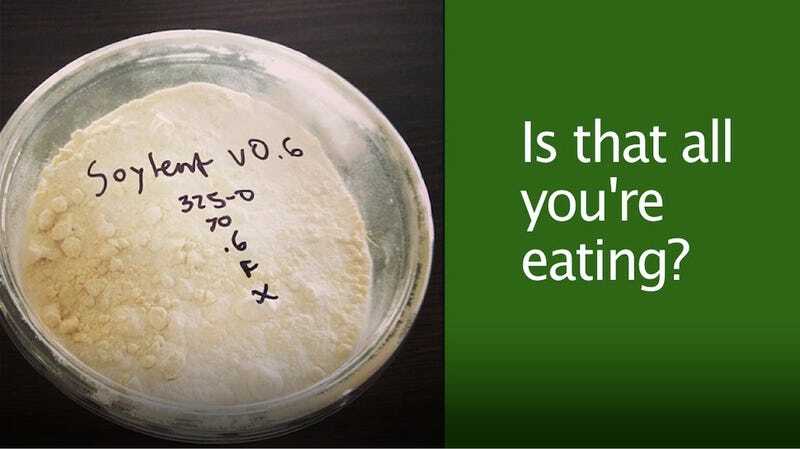 The Internet is currently abuzz about Soylent, Rob Rhinehart's nutritional concoction that he claims could mean that you'll never have to eat food again. It's a repulsive notion to some, but the extraordinarily successful Soylent crowdfunding campaign points to thousands of people who are fascinated by Rhinehart's brand of food hacking. But is Soylent really a viable replacement for real food? Will we ever chow down on kibble made for humans? Soylent is often talked about as a foodstuff created by and for the ramen-eating set, but Rhinehart doesn't see it that way. "As I walked around the city, I noticed a lot of people had trouble with their health and eating well," said Rhinehart, who lives in Brooklyn. "I lived in one of the poorer areas and people were clearly much less healthy than the ones in the more affluent areas, and I thought maybe there was a way that we could get healthy food to people in a more efficient way. I was a little frustrated because I was working on highly technical wireless networks and we were trying to make Internet access cheaper and faster but it seemed like people were really struggling with food." While the cheeky name "Soylent" evokes a morbid laugh from folks who associate it with the film Soylent Green (which is to say, everyone), the goal of Soylent seems more in keeping with the substance from Harry Harrison's original novel that inspired the film, Make Room! Make Room! In the book, Soylent is simply a combination of soya and lentils used to cheaply feed the ever-growing population. Rhinehart's Soylent seems aimed at taking a shortcut through the food deserts and creating the ultimate convenience food—one that is cheap, easily prepared, and contains all the nutrients you need. Soylent isn't the first product to tout complete nutrition. Abbott Nutrition markets its Ensure Plus drinks "for interim sole-source feeding," which it advises takes place under the guidance of a medical professional. (Ensure is also the product being force-fed to hunger strikers at Guantanamo Bay.) And there are people who must intake their nutrition intravenously—though that's a whole different kettle of nutritionally complete fish, one that comes with its own set of health issues. In Rhinehart's mind, the low cost of Soylent is key. He admitted that currently, the product is more expensive than he would like it be, and he's always looking for new ways to lower the cost. I'll fully admit that I was intrigued by Rhinehart's product. I'm probably not the target consumer of Soylent; I love to cook and I'm lucky enough to live in a place where fresh produce is available and in my price range. But I was curious as to whether someone could live on this low-prep diet, curious enough that I kept returning to the crowdfunding campaign page, considering that 30-day supply. Rhinehart has posted the full ingredient list on the Soylent blog. The formula is currently vegetarian, but not vegan, and the FDA has, according to Rhinehart, approved each of the ingredients for human consumption. Rhinehart's background isn't in health or nutrition; it's in electrical engineering. He told us that he learned about nutrition from reading Open Access papers, taking online courses, reading nutrition textbooks, and reading nutrition information from the FDA. His first test subject was himself; he says that he ate nothing but Soylent for 30 days, carefully tracking his health, both through his subjective experience and blood work. He has tweaked the formula a bit since those first 30 days. He says that he's currently on revision seven. "I think it's at a good place right now." He claims that he's lost weight while on Soylent and has more energy. After living on Soylent for 30 days, Rhinehart found that he missed the social aspects of eating. He still subsists primarily on Soylent during the week, eating the occasional recreational meal on weekends. Other folks have since joined him in testing out Soylent, but he couldn't put a number to the people who have lived off it entirely for 30 days. He does say that some of the do-it-yourselfers he's interacted with have lived off their own versions of Soylent for several months. The response from experts, he says, has been divided. He's been contacted by biologists, chemists, and physicians who think the single-source diet is a great idea (including ones who've admitted that they've wanted to try something like this on themselves), and been slammed by nutritionists who find his plan irresponsible. He notes that he's not the first person to try this sort of diet; molecular geneticist George Church at one point ate nothing but a nutrient broth that allegedly made him smell like yeast. We reached out to a handful of nutritional scientists to get their opinions on the product, and they were generally surprised that anyone would want to replace their food with a single mixture. Their opinions of Soylent were overwhelmingly negative. Steve Collins, founder and chairman of Valid Nutrition, a company that manufactures Ready to Use Foods for the prevention and treatment of malnutrition, said, speaking through a colleague, that, except in exceptional circumstances, he felt that trying to replace a diverse diet with a single product was misguided. Susan Roberts, Professor at Tufts University's Friedman School of Nutrition Science and Policy, likened Soylent to already available nutritional shakes. While there might be some benefit to Soylent's low saturated fat content, she said, there are certain risks inherent in a non-food diet. "[T]here are so many unknown chemicals in fruits and vegetables that they will not be able to duplicate in a formula exactly," she said in an email. She says that, if Soylent is formulated properly, a person could certainly live on it, but she doubts they would experience optimal health. She fears that in the long-term, a food-free diet could open a person up to chronic health issues. [T]he fast-digesting soluble protein source (whey) in combination with the simple sugar source (maltodextrin) creates a product that is very high glycemic. This product would not promote healthy glucose control, satiety and cognitive well-being with insulin spiking at each point of Soylent consumption. She also echoed Roberts' sentiment, that ingesting the minimum nutrition required by the human body is not the same thing as maintaining a healthy diet. Could a person live off of Soylent for a while? Certainly, she says, for quite a while; but that doesn't mean that they are taking in the nutrients necessary to prevent disease, manage disease, or live a long life. Anthony also mentioned another issue with Soylent in its current state: the lack of flavor variety. You may have read the flavor feedback from the Gawker staff, but even Rhinehart has said he wouldn't describe Soylent as having a particular flavor. In his mind, that's not a bug but a feature. He suspects that people are less likely to grow tired of the neutral, slightly sweet taste of Soylent than they would of a particular flavor, although he does entertain the possibility of working with flavor scientists to create flavors for Soylent in the future. Anthony notes that scientists working in the field of flavor science will point to flavor as vital to human health and cognition. Variety might not, in this case, be the spice of life; it may very well be essential to healthy living. Rhinehart believes that the fact that he and others have spent months living, at least partially, on Soylent speaks for itself. And as he moves forward with Soylent, he wants there to be complete transparency between the company and its consumers. He hopes to build an inexpensive, healthy diet based on evidence-based research. He does anticipate further tinkering with the Soylent formula, and perhaps developing other sorts of artificial foods entirely. He imagines that perhaps, in the future, eating this type of engineered food would be the rule rather than the exception. And, while the current Soylent corporate team doesn't include anyone from the nutritional or medical sciences, Rhinehart says that they have been speaking to some experienced nutritionists and someone with that background will be the company's next hire. Personally, I decided not to give Soylent a whirl. I wasn't sure what kind of data I—or the Soylent Corporation—would realistically get after just 30 days on the stuff. But despite the bemusement of many nutritionists, there are plenty of folks who are interested in this sort of artificial nutrition. Perhaps, if Rhinehart follows through on making Soylent a research-based company, we will learn more about artificial foods and how to deliver nutrients to the human body more cheaply and more easily.